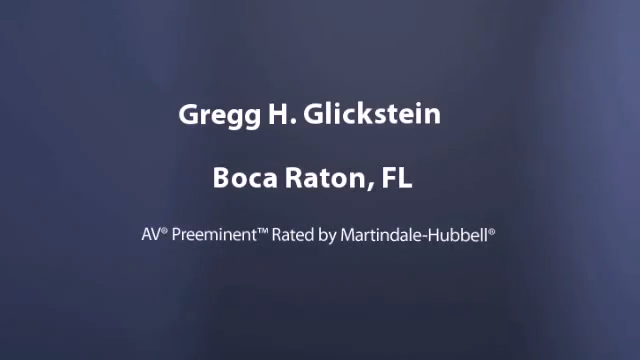 Boca Raton Business Attorney: Gregg H. Glickstein, P.A. For 30+ years, my firm has provided counsel that clients can count on. The AV Preeminent® rating is the highest rating possible for legal ability and ethical standards from Martindale-Hubbell®. With the right business attorney, you can identify risks and opportunities that might otherwise go unnoticed. Gregg H. Glickstein, P.A. is a full-service business litigation law firm focused on meeting the unique needs and objectives of a diverse clientele. For more than 30 years, I have been representing business owners and operators, property owners, real estate sellers and buyers, real estate brokers, landlord, tenants, developers, design professionals and construction contractors, families and individuals throughout Boca Raton and Palm Beach County. My experiences have allowed me to work with many different clients and to handle a variety of business, commercial, and real estate issues and controversies. They have also afforded me the tools and insight to use creative strategies that solve my clients' problems using time-tested, cost-effective methods. Business & Commercial Law: Business transactions are so diverse they are limited only by imagination. All are based on the existence of dynamic business relationships. Preserving such relationships and resolving disputes is a service that I provide to help businesses survive and thrive. I work zealously to protect, preserve, and enforce my clients' interests across a range of business and commercial matters, including business disputes. Real Estate Law: I represent property owners, buyers, sellers, developers, and others in need of resolutions to residential and commercial real estate issues. Let me assist you with real estate purchase and sale disputes, foreclosure ligation, construction disputes, real estate brokerage commission disputes, fraudulent nondisclosure, and any other dispute involving real estate. Landlord-Tenant Law: My firm provides experienced counsel and representation for landlord tenant issues, including lease disputes and lease enforcement. Throughout the years, I have been fortunate to consistently help my clients secure the resolutions they needed. This success is due to the fact that I listen and take the time to understand the facts of the case as well as my clients do. Whether clients come to me for assistance with a pending dispute or for proactive counseling for dispute avoidance, I invest my efforts into helping them achieve their goals. My ability to continually exceed client expectations has earned my firm and myself positive recognition. I am AV® Rated by Martindale-Hubbell®, one of the most trusted attorney-rating services in the nation. This distinction is the highest peer-review rating available and is awarded to attorneys who have exemplified the highest standards of professional ability, ethical conduct, and success. I am also an Avvo.com Top Contributor, often making time to help others find answers to their difficult legal questions. I am prepared to immediately help those who reach out to my firm for assistance. If you are interested in learning more about my services, your case, and how my firm can help, please do not hesitate to fill out a case evaluation form. Gregg H. Glickstein, P.A. represents clients throughout Palm Beach County and Broward County, Florida. To discuss your needs, call (561) 953-6662 today or fill out a case evaluation form. Why Hire Gregg H. Glickstein? Business transactions are so diverse they are limited only by imagination. All are based on the existence of dynamic business relationships. Preserving such relationships and resolving disputes is a service that I provide to help businesses survive and thrive. I work zealously to protect, preserve, and enforce my clients' interests across a range of business and commercial matters, including business disputes. I represent property owners, buyers, sellers, developers, and others in need of resolutions to residential and commercial real estate issues. Lett me assist you with real estate purchase and sale disputes, foreclosure ligation, construction disputes, real estate brokerage commission disputes, fraudulent nondisclosure, and any other dispute involving real estate. My firm provides experienced counsel and representation for landlord tenant issues, including lease disputes and lease enforcement. LEGAL ACTION AND WHAT THAT ACTION SHOULD BE. Business Litigation. Real Estate Matters. Landlord-Tenant Law. Landlord-Tenant Law: What Is "Constructive Eviction?" Are You a Victim of Fraudulent Nondisclosure?